To learn more about the potential location of Sodom click the button below and look under category of Tall el-Hammam. Archaeology, though limited by the very nature of looking through the "trash" or remains left behind by other civilizations, much of it often having been destroyed; has yet provided remarkable support to the accuracy of the written history of the Bible. As well, it has provided insight into the social and technological environment in which the people of the Bible lived and died. Below are just a handful of examples. Websites for further study are listed at the end of this section. VS 10 Lot lifted up his eyes and saw all the valley of the Jordan, that it was well watered everywhere -this was before the LORD destroyed Sodom and Gomorrah -like the garden of the LORD, like the land of Egypt as you go to Zoar. VS 11 So Lot chose for himself all the valley of the Jordan, and Lot journeyed eastward. Thus they separated from each other. VS 12 Abram settled in the land of Canaan, while Lot settled in the cities of the valley, and moved his tents as far as Sodom. VS 13 Now the men of Sodom were wicked exceedingly and sinners against the LORD. " In the Old Testament of the Bible Sodom was a real place. It is thought by many now to be located at an archaeology site named Tall el-Hammam. 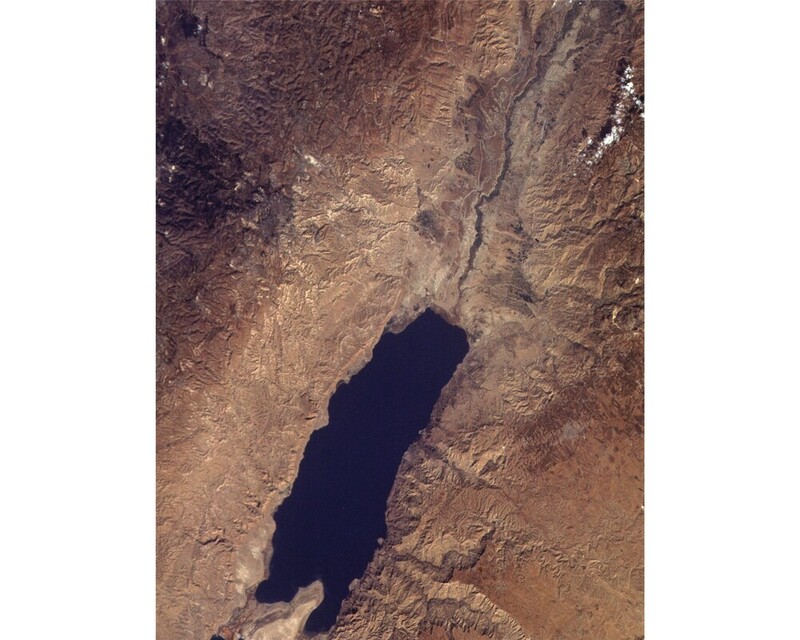 This Tall is located east of the Jordan River directly across from Jericho in the kikkar (circular plain) of the Jordan River, and north of the Dead Sea. See also H.B. Tristram (1875) Natural History of the Bible, 25. Gen. 13:3,10-12: "And he" (Abram) "went on his journeys from the Negev as far as Bethel, to the place where his tent had been at the beginning, between Bethel and Ai,...And Lot lifted up his eyes and saw all the valley of the Jordan, that it was well watered everywhere-this before the Lord destroyed Sodom and Gommorrah...So Lot chose for himself all the valley of the Jordan; and Lot journeyed eastward. ...Abraham settled in the land of Canaan, while Lot settled in the cities of the valley, and moved his tents as far as Sodom." Note: "valley" is kikkar or plain circle/disc. Deut. 34:1-3:"Now Moses went up from the plains of Moab to Mount Nebo, to the top of Pishgah, which is opposite Jericho. And the Lord showed him all the land, Gilead as far as Dan....and the Negev and the plain in the valley of Jericho, the city of palm trees, as far as Zoar." Gen. 19:28 "and he looked down"(from the oaks of Mamre) "toward Sodom and Gomorrah, and toward the land of the valley..."
Photo without graphics from NASA used with permission. 'To add further intrigue, this archaeological stratum was clearly within the Middle Bronze Age horizon. It was the terminal destruction of the city.' Tell me more about the skeletons, I asked. 'Two of our osteologists, Dr. John Leslie, PhD, MD, and Dr. John Moore, PhD, DDS, looked over the bones. The area they concentrated on was the bottom half of the body, including the pelvis region, legs, and feet—the upper portions on two of them were missing. The initial results were amazing and quite exciting archaeologically—but sad in how the people died. They found the bodies splayed out, face down, joints twisted, toes hyper-extended, with many signs of violent burial within collapsing debris. In short, the bodies were extremely traumatized in their death. See online article for more information. Pompeii A City Judged Like Sodom? 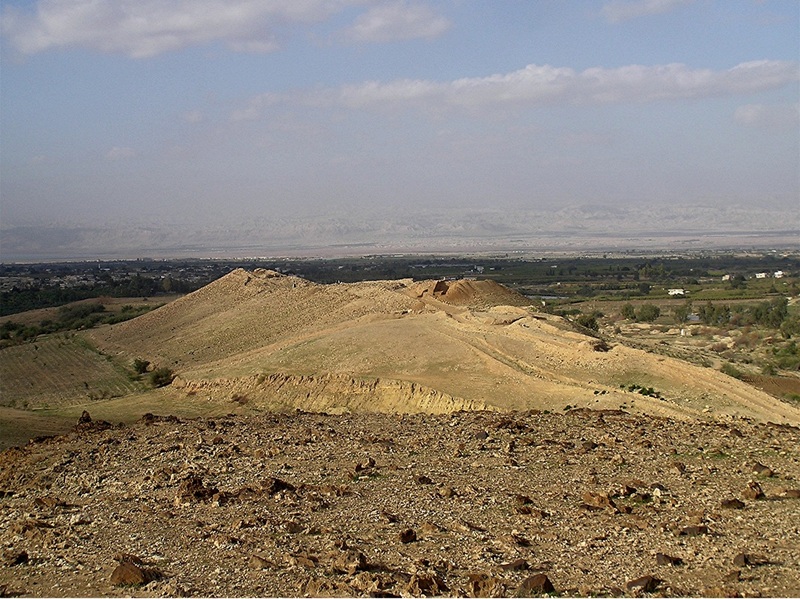 The Jordan Valley: Destruction of Sodom in about 1800 B.C. and Jericho in about 1400 B.C. Joshua, when he brought the Israelites back to the land of Israel may well have stood on the destroyed city of Sodom (Tall el Hammam) and looked west to Jericho across the Jordan River (that is facing to the left from the east or right side of the picture). 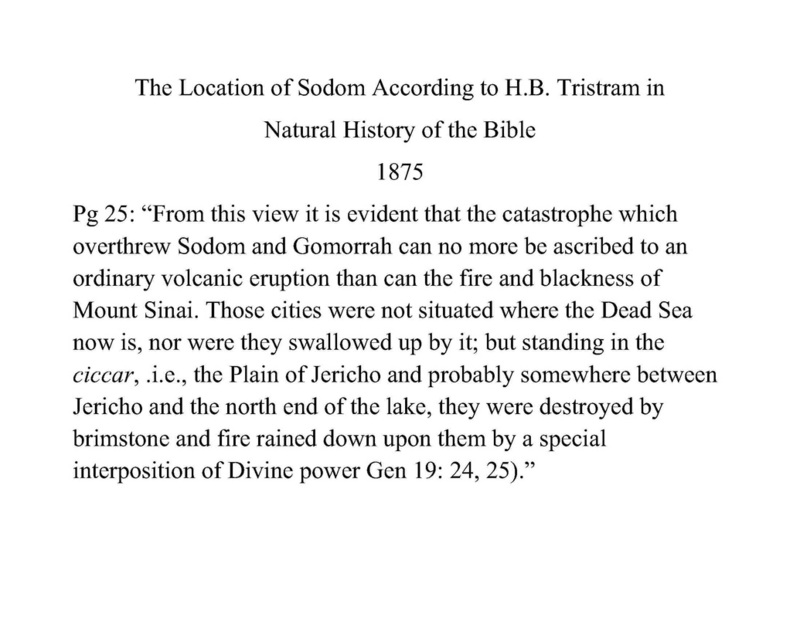 Per Dr S. Collins the destruction of Sodom was about 1650-1750 B.C. Photograph from NASA used with permission. Joshua 6:1) " Now Jericho was tightly shut because because of the sons of Israel; no one went out and no one came in. 2) And the Lord said to Joshua, 'See, I have given Jericho into your hand, with its king and the valiant warriors.' 3-4) 'And you shall march around the city, all the men of war circling the city once. You shall do so for six days....on the seventh day you shall march around the city seven times, and the priests shall blow the trumpets.' 5) 'And it shall be that when they make a long blast with the ram's horn, and when you hear the sound of the trumpet, all the people shall shout with a great shout, and the wall of the city will fall down flat, and the people will go up every man straight ahead. '"...17) "And all the city shall be under the ban, it and all that is in it belongs to the Lord...'"24) "And they burned the city with fire, and all that was in it. Only the silver and gold and articles of bronze and iron, they put into the treasury of the house of the Lord." NASB with permission. Evidence that the current site thought to be Jericho (northeast of Jerusalem and in the Jordan Valley) is correct: 1) The city was strongly fortified in the Late Bronze 1 period, the time of the Conquest according to Biblical chronology (Joshua 2:5, 7,15; 6:5, 20). 2) The city was massively destroyed by fire (Joshua 6:24). 3) The fortified walls collapsed at the time the city was destroyed, possibly by earthquake activity (Joshua 6:20). 4) The destruction occurred at harvest time in the spring, as indicated by the large quantities of grain stored in the city (Johsua 2:6; 3:15; 5:10). 5) The siege of Jericho was short, since the grain stored in the city was not consumed (Joshua 6:15, 20). 6) The grain was not plundered, as was usually the case in antiquity, in accordance with the Divine injunction (Joshua 6:17-18). From Randell Price The Stones Cry Out 1997, pg. 152. He is quoting Dr. Bryant Wood. King David and the Temple in Jerusalem 1010-931 B.C. "David (/ˈ﻿deɪv﻿ɪd/; Hebrew: ﻿דָּוִד, דָּוִיד, Modern David, Tiberian Dāwîḏ; ISO 259-3 Dawid; Arabic: داوُود‎ Dāwūd; Syriac: ܕܘܝܕ Dawid; Ancient Greek: Δαυίδ; Greek: Δαβίδ; Strong's: Daveed) was, according to the books of Samuel, the second king of the United Kingdom of Israel, and according to the Gospels of Matthew and Luke, an ancestor of Jesus. His life is conventionally dated to c. 1040–970 BCE, his reign over Judah c. 1010–970 BCE...The Books of Samuel, 1 Kings, and 1 Chronicles are the only Old Testament sources of information on David, although the Tel Dan Stele (dated c. 850–835 BCE) contains the phraseבית דוד (Beit David), read as "House of David", which many scholars confirm to be a likely plausible match to the existence in the mid-9th century BCE of a Judean royal dynasty called the House of David.Depicted as an acclaimed courageous warrior, and a poet and musician credited for composing much of the psalms contained in the Book of Psalms, King David is widely viewed as a righteous and effective king in battle and civil justice. He is described as 'a man after God's own heart' in the books of I Samuel and Acts." From Wikipedia online 4-29-15. "Solomon (/ˈ﻿﻿﻿sɒ﻿﻿l﻿ə﻿mən﻿/; Hebrew: שְׁלֹמֹה, ﻿Modern﻿ Shlomo, Tiberian Šəlōmō ﻿ISO 259-﻿﻿3﻿ Šlomo; Syriac: ܫܠܝܡܘܢ Shlemun; Arabic: سُليمان‎ Sulaymān, also colloquially: Silimān or Slemān;Greek: Σολομών Solomōn), also called Jedidiah (Hebrew יְדִידְיָהּ), was, according to the Bible (Book of Kings: 1 Kings 1–11; Book of Chronicles: 1 Chronicles 28–2, 2 Chronicles 1–9), Qur'an, and Hidden Words a king of Israel and the son of David. The conventional dates of Solomon's reign are circa 970 to 931 BC. He is described as the third king of the United Monarchy, which would break apart into the northern Kingdom of Israel and the southern Kingdom of Judah shortly after his death...The Hebrew Bible credits Solomon as the builder of the First Temple in Jerusalem. It portrays him as great in wisdom, wealth, and power, but ultimately as a king whose sins, including idolatry and turning away from Yahweh, led to the kingdom's being torn in two during the reign of his son Rehoboam." From Wikipedia online 4-29-15. King Hezekiah of Jerusalem the Events Regarding the Army of Senecharib 701 B.C. Sennacherib King of Assyria (from 705-681 B.C.) invaded Syria and Palestine (so called later on by the Romans) and conquered 46 towns and boasted that he captured 200,150 (two hundred thousand and one hundred and fifty) captives which he deported to other countries. The siege at Lachish occured in 701 B.C. It was the 2nd largest city in the Levant-Jerusalem being the first. George Smith (ed by A.H. Sayce) in his book, 1878, translated many of the cuneiform regarding Sennacherib's war with Hezekiah in section 4 titled The War with Hezekiah. As will be seen in the following reports, it was clear that Sennacherib intended to come against Jerusalem and destroy it. Yet, while there is significant documentation of his success against Lachish no such evidence supports his claim that he "turned the key of Jerusalem." The scriptures proclaim that he will turn away from Jerusalem (against the Egyptians? ), and he does so. It also predicts that he will fall by the sword at the hands of his sons. The report of Esar-haddon, another son who took the rule from the brothers who killed the father, states that this did indeed happened. This is a classic story where Hezekiah, a believer in Jehovah, becomes afraid of a greater nation and gives him all the gold and silver he has, but even this does not satisfy that ruler. He intends to destroy the Jewish nation, and mocks their God. Yet, God who rules in the affairs of men hears Hezekiah's cry for help to Him. It is Hezekiah turning to God instead of the strength of the arm that eventually saves him and his nation. The event is chronicled by the Jewish and the Assyrian records, and even panels portray part of it on the Walls of the palace in Nineveh. As for Hezekiah the Judahite, who did not submit to my yoke: forty-six of his strong, walled cities, as well as the small towns in their area, which were without number, by levelling with battering-rams and by bringing up siege-engines, and by attacking and storming on foot, by mines, tunnels, and breeches, I besieged and took them. 200,150 people, great and small, male and female, horses, mules, asses, camels, cattle and sheep without number, I brought away from them and counted as spoil. From: Prism of Sennacherib. Note that here he does not mention taking Hezekiah captive or overthrowing Jerusalem 9-10 years after the event. Cyrus The Great and the Persian Empire -see Old Testament section on this website. 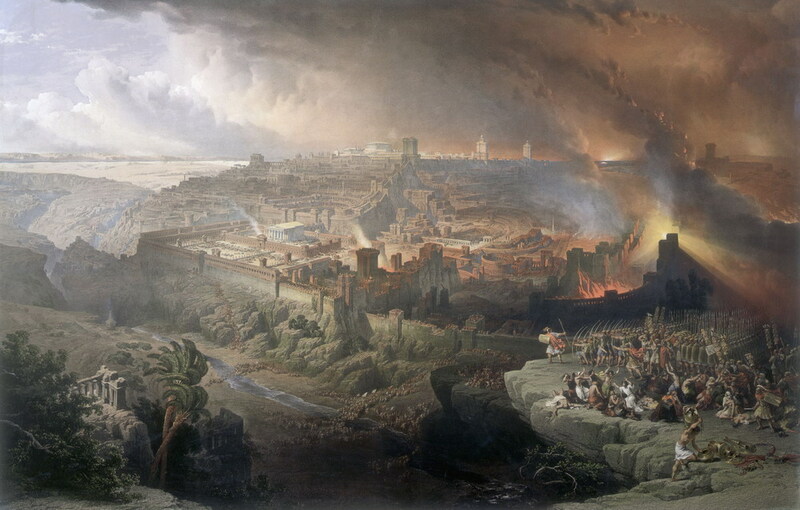 In 70 A.D. the Roman troops of Titus (and Vespasian) destroyed the 2nd Temple, in Jerusalem, casting the marble blocks off the Temple Mount onto the Roman street below. The stones crushed the sewer system below the stone road. This area has been recently opened up by excavation. 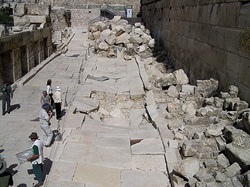 Dating of the area was done partly by the coins found in the rubble, and also by associated descriptions with the writings of the Jewish writer Josephus in about 300 A.D. and the Roman writer Tacitus in about 100 A.D..As well, the Roman Arch de Triumph portrays the removal of the Temple worship utensils. 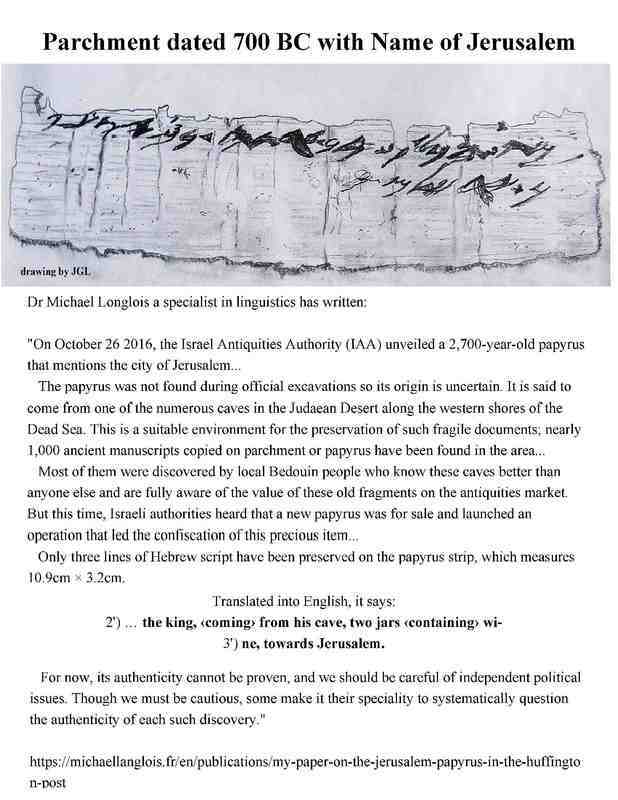 One Hebrew script engraving was found in the rubble and it has been thought to be from the corner of the Temple where the priest blew the shofar and reads "the place of trumpeting"- picture (of a copy of it) to right hand side. Jesus is quoted in the book of Matthew 24:1-2,Jesus came out from the temple and was going away when His disciples came up to point out the temple buildings to Him. 2 And He said to them, "Do you not see all these things ? Truly I say to you, not one stone here will be left upon another, which will not be torn down." Parchment with the name of Jerusalem: 700 B.C.